When Narinder Singh co-founded cloud consultancy company Appirio in 2006, the startup was just “four guys in a room building something.” A decade and 1,200 employees later, Appirio is a global leader in helping brands such as eBay, Facebook, Coca-Cola, and L’Oréal maximize the business potential of innovation through mobile and cloud technology. But international success wasn’t Singh’s main focus during the 10 years leading up to Appirio’s $500 million acquisition by Wipro in 2016. The entrepreneur and engineer was devoted to building the company one goal at a time. An engineer with a desire to be more than “just a techie,” Singh started his career in 1995 in the San Francisco Bay Area writing code at Accenture’s Center for Strategic Technology. He planned to apply to law school, but the possibilities opening up at the epicenter of Internet development were too enticing to leave. “By then, I was obsessed with technology,” he recalls. Instead of going to law school, Singh joined the startup webMethods (now Software AG), where he led new product creation as vice president and general manager. He developed the niche product webMethods Trading Networks in 2000. It became the most successful new product introduction in the company’s history and became the foundation of all of the webMethods business-to-business products. Having watched the company’s stock plummet during the dot-com crash, Singh became determined to understand what had happened. That’s when he decided to pursue an MBA at the Wharton School of the University of Pennsylvania. In 2004, his newly minted MBA in hand, Singh moved into management consulting at computer software company SAP in the Office of the CEO’s Corporate Strategy Group. There he tackled corporate and competitive strategy, operational efficiency, and organizational effectiveness. The requisite attention to detail suited his engineering sensibilities. While at SAP, he continued to aid in the growth of the Sikh Coalition, a non-profit he co-founded after the 9/11 tragedy to educate people about and fight discrimination against the American Sikh community. Singh searched for software solutions to handle fundraising and legal data. When he couldn’t find what he needed, he decided to build it himself using Salesforce, a new software-as-a-service company. His engineering mindset started kicking in, and Singh became convinced that this model of deploying software over the web was going to become huge. He left SAP in 2006 and co-founded Appirio with friends from webMethods. Partnering with companies like Salesforce, Google, and Workday, Appirio became a leader in applying cloud and emerging technologies to improve organizations’ processes and create disruptive market solutions. “We pushed forward this concept that enterprises needed to think about cloud technology if they wanted to remain competitive and nimble,” Singh notes. 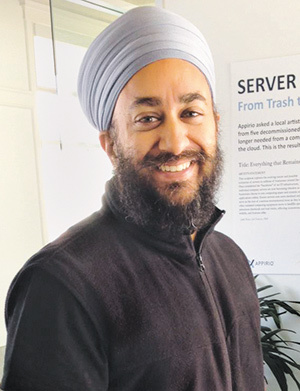 While he remained on the Appirio board of directors, Singh left daily operations in 2015 to pursue the next chapter in his ongoing quest to understand how things work from the bottom up, this time focusing on the healthcare industry. To understand the industry better, he earned a master’s degree in translational medicine from a combined program at University of California, Berkeley and University of California, San Francisco.